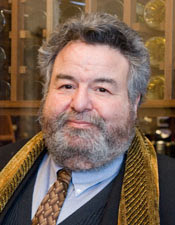 Steven C. Kolpan is a professor of wine studies at the Cuinary Institute of America. He holds the The Charmer Sunbelt Group Endowed Chair in Wine and Spirits. Like Kevin Zraly before him, Mr. Kolpan began his life in wine as the sommelier and Maître d'hôtel at Depuy Canal House, which was one of the two or three hottest restaurants outside NYC for many years. He writes regularly on wine and art for Salon.com, The Valley Table, Wine from Spain News: International Cookbook Revue; The National Culinary Review, The Daily Freeman, Up River/Down River, The Woodstock Times, among many. I should also point out that Exploring Wine is one of the best selling wine books of all time. It is without question, the mostly high adopted book used by wine professors throughout North America and has sold in the hundreds of thousands of copies through three editions. It is a massive tome, that is easily a reference for the popular reader as well. The reason I am going on about Steven is because while the Hudson Valley is rich with wine writers (and there are a great many of them - thankfully!!!) undoubtedly Steven and Kevin Zraly stand tallest among the crowd as of this writing (I apologize if I am missing someone...I haven't had my morning cup-o-joe yet). Of all the major wine writers in the US, Steven has been the most active in the Hudson Valley and deserves kudos for it! He deserves immense gratitude from the winemakers of the Hudson Valley! More than any other major wine writer, Steven ha tasted more Hudson Valley wines, followed our industry with great care, visited the tasting rooms, promoted the successful wines on air on WAMC, and has judged at numerous events. And he backs up his reviews. 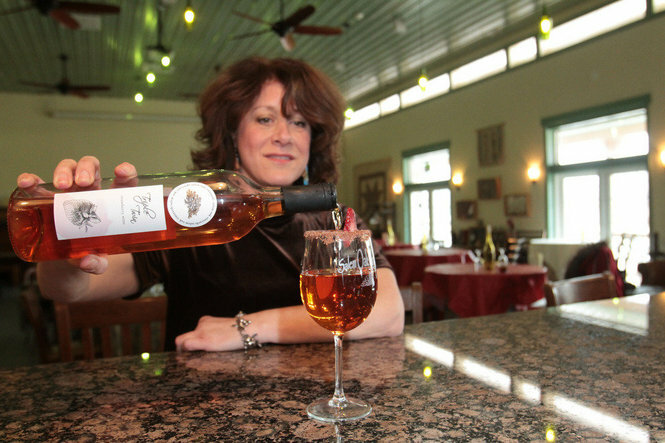 The Culinary Institute carries a dozen Hudson Valley wines on their wine list. And the credit needs to go to Steven. Steven is a lovely man. He is friendly, has a dry sense of humor, and takes wine and food seriously. I have lunched with him several times, and see him often at wine tastings in the valley as well as major portfolio tastings in New York City. 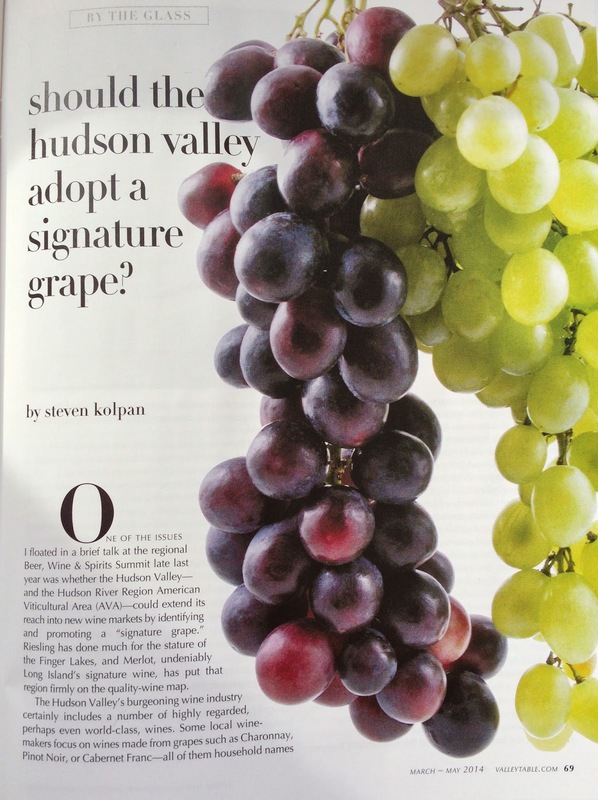 Recently, in the March-May issue of The Valley Table, Steven published an article, "Should the Hudson Valley Adopt a Signature Grape?" Steven, as can be expected, handled the question with great care and diplomacy. But ultimately, he came down on the side of YES. He's not the first to talk or write about this question here in the valley. But his is certainly among the voices, due to experience an accomplishment, that should be heeded most. He pointed out that some world class wines are already being made in the Hudson Valley. And throughout the article recommended wineries up and down the valley worth trying and drinking. But he also pointed out that the Finger Lakes have claimed Riesling, and that Long Island has Merlot, and that the Hudson Valley has not yet adopted a single grape in a more forceful way. 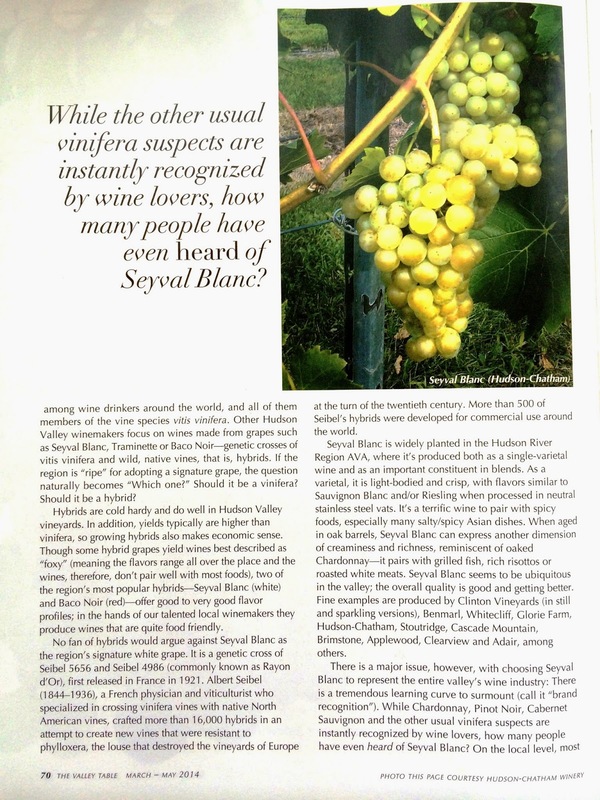 Steven rightly points out that Seyval Blanc is definitely the most widely planted white, but that there are plantings of Riesling and Chardonnay. On the red side Cab Franc, Pinto Noir, and Baco Noir seem also to be planted in equal amounts. He suggests we pick a grape and rally around something, preferably vinifera. I think Steven Kolpan is absolutely right. I took a long way coming to it. But I have my own version of how it should be. Firstly, with whites, there is no question that Chardonnay and Riesling plantings are on the upswing. And four or five years form now, both will be staples on most quality wine lists. On the red side, Pinot plantings are on the rise, as are Cab Franc plantings. It is starting to happen already. And as a winemaker, and valley blogger, I have every intention of pushing those new wines as they come online. I have three caveats though. First is, I think that any region also needs the diversity we have, and that we shouldn't be ripping out anything in particular. We shouldn't make Cab Franc the star to the exclusion of other grapes (which Mr. Kolpan does not advocate in his article). I think diversity in any US wine region remains a driving force. But we should ADD to our plantings. There's not enough fruit in the Hudson Valley to fulfill the current demand. I love Pinot Noir, but it is finicky and grows better from the mid-Hudson on down. It's harder for northern climate vineyards. Cab Franc seems to be the future of the Hudson Valley, and I am happy for it. But I also see a Hudson Valley that continues to push Pinot Noir and Baco Noir.....and here's why. The Hudson Valley is making some of the best reds in New York state. Our current Cab Francs, Pinot Noirs, and Baco Noirs are fabulous Burgundy-styled reds on the east coast. We are making soft, approachable, medium bodied reds like no one else, and at prices few can match (we're probably underpricing our wines). We make great wines. But adding to that reputation by making more good red will absolutely help get the message out. We are uniquely situated, by geography, to make these wines, and excel at them. Mr. Kolpan rightly points all this out. My second caveat is this, let's try not to make big California/West Coast Cab Franc, but to make lighter, Loire-ish styled Cab Francs, that are more like Pinot Noirs than Cabernet Sauvignons. Up and down the east coast I am disappointed with Cab Franc varietals that are soaked and soaked, trying to get deep color and richness of flavor. The problem is that most of these wines would have been much better being pressed and made lightly, so as not to pick up many of the off flavors Cab Franc can often give off, especially if any of the fruit is not as ripe as it might have been in a warmer climate. This would be the best of all possible worlds. Bright cherry, spice, hints of vanilla - good. Herbaceous-ness, green bell pepper - bad. My third and last thought is that every winery in the valley should be making one good solid blend. Blends were originally made in cool climate regions to cover up the holes of individual wines. Some wines produce great fruit but lack finish. Or have great fruit up front, a nice finish but no middle. The concept was to blend two or three wines to make a much more classic, well balanced, elegant wine. I think this kind of treatment continues to be the salvation of other eastcoast wine regions like Virginia, and Maryland, where the trend has been incredibly successful. I hope these caveats don't seem pissy. As an editor, blogger, and winemaker, I have thought often of this question, and it has been a sore subject since I arrived in the valley, as agreement and knowledge did not allow us to make these things happen. I believe that the valley has improved its winemaking knowledge and it's vineyard keeping knowledge. And that now is the time to move forward in a big way. I think the valley is ready! I urge all Hudson Valley winemakers to read Mr. Kolpan's article if they haven't already. I suggest we rally around his suggestion of Cabernet Franc (and Pinot Noir) and move forward with our Loire-ish/Burgundy message of beautiful, well-balanced, soft approachable reds. Most of all I want to thank Mr. Kolpan for his continued support and advice. I have spoken with many valley winemakers, and all have remarked on this note. I think his is an important voice, both nationally as well and regionally, and we not only welcome his involvement, but would love to include him more often. That's not just from me - that from the whole winemaking community in the valley! Recently, Ed McCarthy, co-author of Wine for Dummies with Mary Ewing-Mulligan, wrote an exceptional piece on New York state wines! Ed has forgotten more about fine wine than I know. He's incredibly knowledgeable about wine, and a nice guy to boot. Ed McCarthy is author of Champagne for Dummies and co-author of Wine For Dummies, White Wine For Dummies, Red Wine For Dummies, Wine Buying Companion For Dummies, French Wine For Dummies, and Italian Wine For Dummies, as well as regular contributor to QRW magazine, and columnist for Nation's Restaurant News and Beverage Media. He and Mary Ewing-Mulligan co-authored WINE STYLE, published in October '05. I beg you to write is overview below, especially the last paragraph of his article which I have included...and go to the website to see the wines and their reviews!!!!! High praise indeed from a very, very trusted source! Go read the entire review and buy some New York state wine! 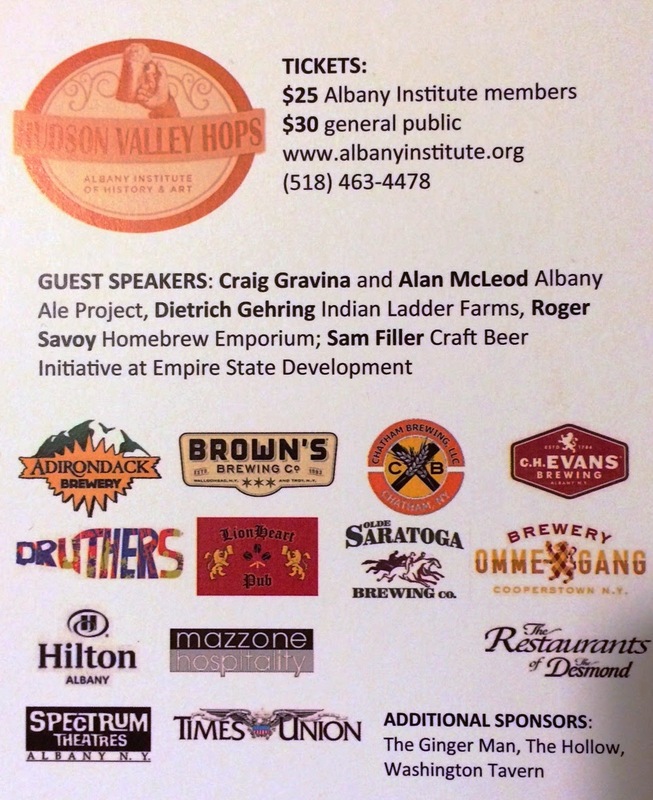 Come join the third annual Hudson Valley Hops, a celebration of the history of brewing in Albany and today's craft beer industry in the Hudson Valley. There will be an exhibition of historic local brewery artifacts, a series of talks by beer historians and brewery experts, local craft beers, good food, and a commemorative glass for participants. Please call (518) 463-4478 for more information. Just received a copy of Josh Christie's MAINE BEER: BREWING IN VACATIONLAND from a friend of mine in Maine. In the nineteenth and twentieth centuries, Maine was a stronghold for the temperance movement, but the Pine Tree State emerged from Prohibition to create a beer culture that rivals any other in the United States. Early pioneers, like D.L. Geary, established the Northeast's love affair with English-style ales, and today's upstarts brew unique and inventive recipes. Maine brewers create beer for every palate, and Maine's unique flavor--like blueberries, potatoes and even oysters--are frequently featured. Maine beer expert Josh Christie discovers the story of brewing in Vacationland by exploring Maine's large breweries, like Shipyard; its local crafters, like Rising Tide; the budding cider, spirits and mead industries; and, of course, the best places to drink across the state. 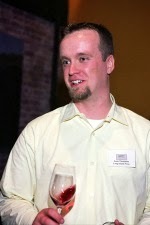 Josh Christie's writing has appeared in print in the Portland Phoenix, the Maine Sunday Telegram and other publications and online as a featured columnist at RateBeer.com. He lives in Yarmouth, Maine, with his wife, cat and steadily growing beer cellar. Brews and Books (Josh's blog/website) is a site for everyone’s inner Hemingway - a site about books with a healthy passion for alcohol. Er, maybe a better example is everyone’s inner Sam Calagione, an English-major-turned-brewer. Wait, that isn’t perfect either. BrewsAndBooks.com is a site for everyone that loves a good book in one hand and a good beer in the other. The blog first arose out of a desire to share reviews of well-written books and lovingly-brewed beer. The site has evolved slightly from this original purpose, and now shares news in the brewing, publishing, bookselling and beer worlds along with reviews and editorial content. Who writes Brews and Books? 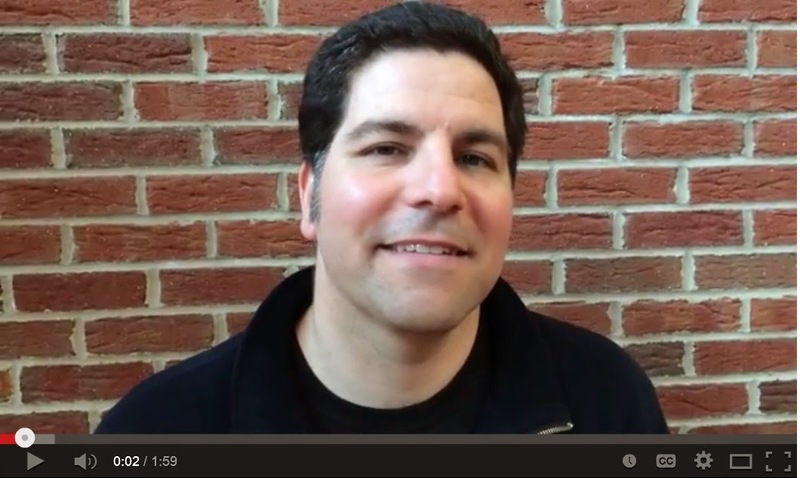 I’m Josh Christie, author, EIC and creator of this site. I have a degree in Political Science from the University of Maine and work as a bookseller and freelance writer. When I’m not reading a book or enjoying a beer, you can usually find me roaming around practicing my photography, skiing, hiking or otherwise enjoying the coast and mountains of Maine. This book is an excellent primer on Maine Beers and is a very good guide for the beer lover who lives in Maine and wants to follow up with the local brews, or for the vacationer looking to taste some of the local stuff. Some good Maine beer history. Great stories. Lot's of fun! Belated Happy Birthday to the New York Cork Report: 10 Years Old! So, recently I had lunch with Lenn Thompson, who founded the New York Cork Report tens years ago in March 2004. 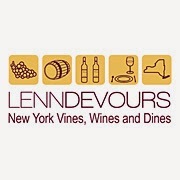 Back then it was Lenndevours.com and the small blog covered the emerging Long Island wine region. Those were heady days. He was married, but with no kids. He threw raves at bars and wineries, promoting local wines. He would send a shout out, and suddenly there was a large group filling up a tasting room. He profiled numerous winemakers. He helped put fine wine on the map in Long Island. Back then, between Howard G Goldberg in the New York Times and Lenn Thompson with Lenndevours, Long Island had what seemed like an insurmountable lead in the world of New York wine. I laughed as I followed him up and down Route 25A on Long Island, the back of his car tagged with Pittsburgh Steelers bumper stickers. He can be loud, boisterous, opinionated (I am sure he'll have some critique of this piece), funny, devilish, and just plain down to earth (as when he lost weight on Facebook last year, showing shots of the scale, his weight, and his feet - for which he took a lot of abuse). He loves his family...his children. He is a loyal friend. He is also a fan. He is a true believer. And that kind of fanaticism has served him well in sports and in wine. So when we sat down to eat, I asked him what his first post was. He didn't remember, he laughed. When they migrated the site from Lenndevours to the new New York Cork Report, he lost the first post. He doesn't even remember what it was. "It’s going to sound horribly cliche to say this, but when I started the New York Cork Report (then known as LENNDEVOURS), I never imagined that I’d be writing a post on it ten years later. It was a diversion. A creative outlet. A way for me to easily tell my friends and family about the wines I was drinking and discovering here on Long Island. But here we are," Lenn wrote on his blog. It doesn't really matter if that first port was lost to time, does it? The fact of the matter was that the New York Cork Report was a massive sea change in his blogging days. With the establishment of the New York Cork Report a new kind of wine blogging was being done...and being done well. Yes, there were other local bloggers - in fact it was Lenn who recused me from the witness protection program of the wine blogging world and thrust me in front of the other bloggers in 2006 when he outted me for my wine writing. But when Thompson re-branded his site, he did more than change the name of his site - he changed the game. The NYCR in essence stopped being a blog and became an internet magazine. Lenn was suddenly Editor-in-Chief and he had a revolving cadre of wine, beer, and food writers spinning through a revolving editorial board. He brought in Evan Dawson, a charismatic regional news anchor in Rochester, who was by day a professional reporter and journalist, and Dawson's input had an enormous change on the NYCR. They became even more professional in tone, and now their game was just not the wines of Long Island but the wines of New York. And they were interested in only fine wines. Thompson and Dawson were and remain a formidable team. This was no longer blogging - this was reporting, journalism, essays. This wasn't some local hack writing about a tasting room experience. They asked tough questions and made it into the most powerful regional wine website in the country. This was no small feat. 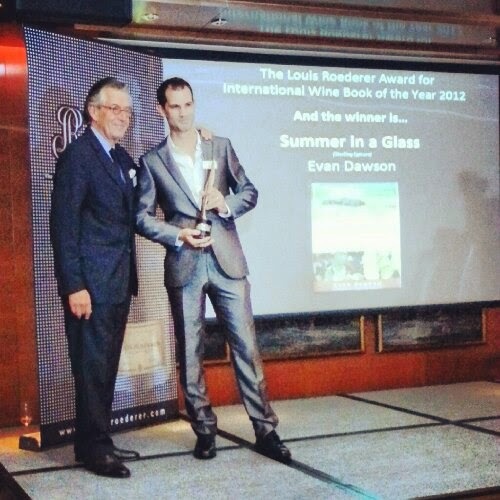 And since then, it helped launch the career of Evan Dawson as a writer, who with his SUMMER IN A GLASS, captured the prestigious Roederer Award for best wine book in the world, the highest award handed out for wine and spirits writing. Dawson ha to go to Europe to collect his hardware. In the meantime Thompson and Dawson courted other wine writers throughout the business, and in their own way, spread the gospel of New York wine. Complaints? There've been a few. Thompson, a sometime enfant terrible, can be somewhat difficult in his reviews, once stating that a wine tasted like "pool water." Winemakers can sometimes be skittish about sending him wines. He could tweak the nose of the powerful, and pick a fight with the best of them. He is a wine snob - and his hard on hybrids and chardonnay. He is happy to yell "Tripe!" when tripe is served. That doesn't make you a lot of friends. His website has offered a dialogue board for the industry, which in some cases, has afforded a public view of some very private disagreements. And there is still a small band of Long Islanders that feel abandoned because he fell in love with the Finger Lakes and Erie. Not true, but what was Long Island's loss was New York State's gain. While Thompson is still a fan of Long Island, he and his team were very effective in raising the profiles of dozens of wineries in the Finger Lakes, Lake Erie, Niagara, and the Hudson Valley. If you are making good wine in New York state, Thompson and his team wanted to taste it and promote it. "It has been — and continues to be — an amazing experience. Because of the words on these virtual pages, I’ve met, tasted with, worked with and learned from too many talented, generous people to mention. I’ve worked harvest a handful of times. I’ve landed writing gigs for some of the publications I used to read and still read regularly. I’ve spoken to an audience of winery owners and winemakers about social media and bloggers. I’ve organized three-day wine country tours in wine regions from Virginia to Ontario and points in between. And most importantly, I hope we’ve been good for New York wine," he wrote. He has immense passion for the industry, and does not suffer the egos and foolishness that interfere with its rise in anyway. He is not interested in regional petty rivalries. There is no doubt in my mind, that no history of New York state wine could be written without a chapter of it being devoted to Thompson and his New York wine virtual magazine. "I like to think that we’ve helped get some much-deserved attention for the New York wine industry. There are so many distinctive, delicious wines being made in New York today that far too many people don’t know about. Sharing the joy and pleasure that we find in local wine, beer and spirits has always been our top priority. We don’t get paid to do this. We do it because we live to find the best local wines and to tell the stories behind them. I can’t imagine not having the NYCR at this point. It’s gone from hobby to obsession to just a part of everyday life. We’d probably do it even if no one were reading," he continued. 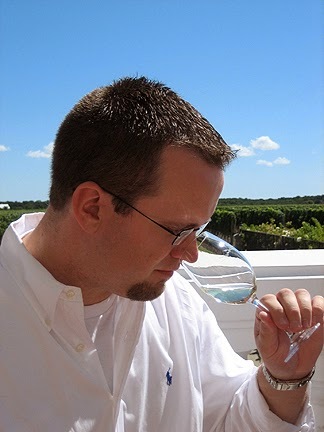 Since founding the website, he has gone on to join the board of Drink Local Wine and NYCR offers taste camps around the state and on the east coast. The highest compliment I can offer is this - a winemaker from another state recently said to me, "I wish we had a New York Cork Report for our region." Enough said. Lenn and I don't always agree - on wines, on what's good for New York state wine, or on sports - but the one thing I have to respect, among many, many things, is his passion for wine and for the region. Here's to another ten years and beyond!! When Mandi Cassidy bought a farm in Oldmans Township, it was her “French connections” that steered her toward her new path. With family in France — she’s a second generation French American — many of her relatives had small vineyards on their properties. So, she thought, I shoud do the same. After all, it is the Garden State. “It was the Garden State long before anyone knew it would be a vineyard state,” Cassidy said. Today, according to Cassidy, New Jersey wines are beginning to outpace those made in California. Back in the 1970s, California was trying to prove itself as a wine region and that’s what New Jersey is doing now. And although her winery, Salem Oak Vineyards, is just outside of the Outer Coastal Plain American Viticulture Area — a region known for winemaking in South Jersey — the rich soil in the state, and particulary on her five-acre farm, is perfect for growing grapes for good, often award-winning wines. “We’re going to give Bordeaux a run for their money,” she said. At first, it was just her and other close family members experimenting with wine making, she said. Guests visiting the vineyard, which has a large tasting room, don’t think it’s weird at all. Cassidy said the winery has only been open since December, but through social media and word of mouth, more and more wine lovers have visited the vineyard. And they all leave with a bottle or two in hand. Since it’s such a family affair, Cassidy decided to name the bottles of wine after the children in the family. There’s the Mathis and Juliamarie, a red and white named after Cassidy’s 18-year-old twins; the Luke, her nephew, and the Analise, her niece. Her other niece and nephew, Jake and Olivia, are still awaiting their vintages, but there’s also the Triple Twin wine — a pink, strawberry vintage named for the two sets of multiples born in the family — Cassidy’s twins, and her brother’s triplets — Luke, Jake and Olivia. "Everyone loves the Triple Twin wine,” she said. “It’s so much fun to use the crops here and make amazing, yummy products,” she said. Wineries in South Jersey continue to pop up year after year, but Cassidy is happy with the friendly competition. For a wine region to get the attention it needs, more wineries need to be in that region, she added. For more information about Salem Oak Vineyards visit, www.salemoakvineyards.com or call, 856-889-2121. Spring is almost here and so is Pasta Primo Vino 2014! Fourteen different pasta varities are provided by Barilla Pasta again this year. This year we have reduced the price of Pasta Primo Vino to make it even more affordable whether you visit the trail over 1 or 2 days. You now have time to leisurely visit all 14 wineries. Yes there are now 14 wineries for you to visit on April 12th & April 13th. You don't have to take two days but you can if you want! Pick a starting winery, where you will begin your experience with a souvenir wine glass! Sample 4 fabulous wines while you further tantalize your taste buds with a sample of delicious Barilla pasta dish. Off you go, to your next winery to sample more Hudson Valley wines plus another tasty pasta recipe. On you go until you have visited all 14 wineries! 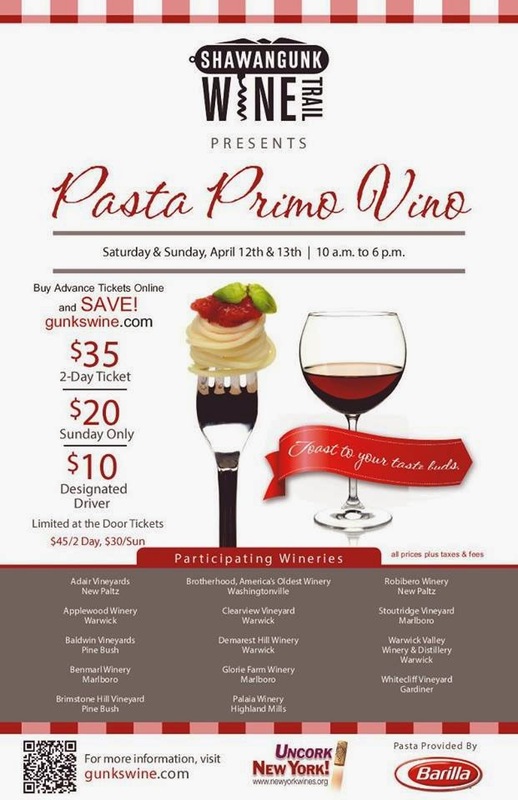 Tickets are good for two days* and include a souvenir wine glass, wine 7 pasta tastings at all 14 wineries for $37.80 (includes tax). We do offer a Sunday Only ticket for just $21.60 (includes tax). To ensure a safe and enjoyable visit, we also offer a reduced Designated Driver Ticket for just $10.80 (includes tax). You can enjoy safely your wine sampling while your driver gets to enjoy 14 great pasta dishes and an alcohol free beverage. A very limited number of tickets will be available at the door ($48.60 includes tax) for a two day tasting ticket, $32.40 (includes tax), Sunday Only ticket, the Designated Driver tickets remain the same great price. What a great way to usher in the new wine releases of the season and experience first class NYS wines. At Farm Film Festival 2014, yesterday, at the Crandell Theatre, in Chatham, NY, we saw HOPPED UPSTATE a wonderful and informative movie about the regeneration of hop farming in New York state. Hop farming had once been the domain of New York state, especially in the areas surrounding Cooperstown, but the entire industry moved about 100 years ago, and then Prohibition killed off what little part of the industry was left. Today, it is a fast growing part of the agricultural landscape. Fantastic, short little film! Eye-opening! Following the passage of New York State’s Farm Brewery Law, new hop farmer Dave Pasick is not only looking to revive his century old family farm in upstate New York, but to be part of a budding economic movement in his rural hometown. Hopped Upstate: The Rise of Hop Farming in New York was shown at the 2013 Northeast Hop Alliance Annual Conference. HOPPED UPSTATE is a video project following the rise of hop farming in New York state. Over the last decade, the country has seen an enormous shift in beer consumption from the mass-marketed ”American” lagers made by large macrobreweries like Anheuser-Busch InBev and MillerCoors to dynamic, flavorful, home-grown brews created by small, region-specific microbreweries. New York itself ranks in the top three states with the fasting growing craft beer industry. It’s been called a “bright spot” in the economy and the rapid growth is expected to continue well into the future. In 2012, Governor Cuomo and the state legislature started taking necessary steps to support craft brewers and farmers by passing the Farm Brewery Act, which includes tax incentives and other benefits to give financial relief to burgeoning breweries. The legislation also requires that 20% of ingredients used by breweries must come from NYS farms, and that will increase eventually to 90%. In response to the Farm Brewery law, Dave Pasick is starting a hops yard on his family farm in Utica, NY. Feeling confident that Upstate New York’s craft beer scene will continue growing, he’s hoping it will create a new market for hops needed by local breweries. Dave is now onto his second growing season and is not only looking to produce a larger harvest this year, but to be a part of a budding economic movement in his rural hometown. Watch the full documentary below. About the filmmaker: Leslie Von Pless is a video producer and photographer based in Brooklyn and Syracuse, NY. She works full-time as the Communications and Multimedia Strategist for Lambda Legal, a national LGBT rights organization. Her videos have been featured in the Chicago International Social Change Film Festival, the Lights. Camera. Help. Nonprofit Film Festival, and she has previously won 1st Place in the YouTube Video Volunteers contest. Hopped Upstate: The Rise of Hop Farming in New York is her first independent short documentary project. As a photographer, Leslie focuses on landscape, nature, and outdoor digital photography. She belongs to the Central New York Art Guild and Cooperstown Art Association. She received a B.S. in Communications/Digital Video Production from Fredonia State University. 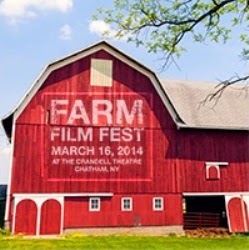 I recently went to the Farm Film Fest at the Crandell Theatre, in Chatham, NY this past Sunday. While there, I saw a number of wonderful movies. One of the ones mot pertinent to me was Crafting the Cider Comeback which was produced by the Glynwood Center. 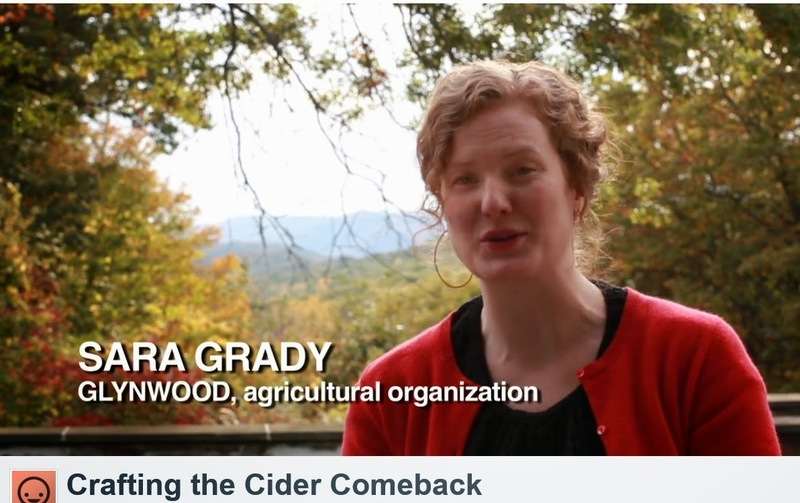 A wonderful, short piece featuring so many of the Hudson Valley's leading cider figures including Sara Grady, Elizabeth Ryan, Dan Wilson, Tim Dressel, Derek Grout, and many others. Also, a nice piece with Steve Woods from Farnum Hill in N.H.
Crafting the Cider Comeback describes the reemergence of hard cider and other apple spirits specialty product manufacturing in the Hudson Valley. It highlights an exchange program with cider producers in France, where these products have long been part of everyday life. About the filmmaker: Glynwood’s mission is to save farming by strengthening farm communities and regional land systems. Their goal is for small and mid-sized farmers to thrive, on the land and in the marketplace. Much of their work focuses on farming in the Hudson Valley. Here's the link to watch it online! Is this a cat people vs. dog people kind of thing? Well, yes, actually it turns out to be just that. So who is the dog in this scenario? Well...both sides. You see, I see wine people as being trapped, wherein I see beer people as explorers. This analogy came to me while having afternoon espressos with publishing executive J. P. Leventhal, of Black Dog & Leventhal, one of the most urbane (and hilariously funny) people I know. He has a very dry sense of humor, and you can easily imagine him having a wonderful conversion with A.J. Liebling (with JP easily holding his own). JP said he wasn't a beer person, and wrinkled his nose. He just didn't get what all the excitement about beer was about. Wine, on the other hand, with his eyes lighting up, was something he COULD get excited about. It was then that I told him about my theory. You see this is it in a nutshell - wine people are like the folks that show their dogs at the Westminster Kennel Club dog show. Westminster is one of my favorite events in the calendar year...so I am not bashing here. 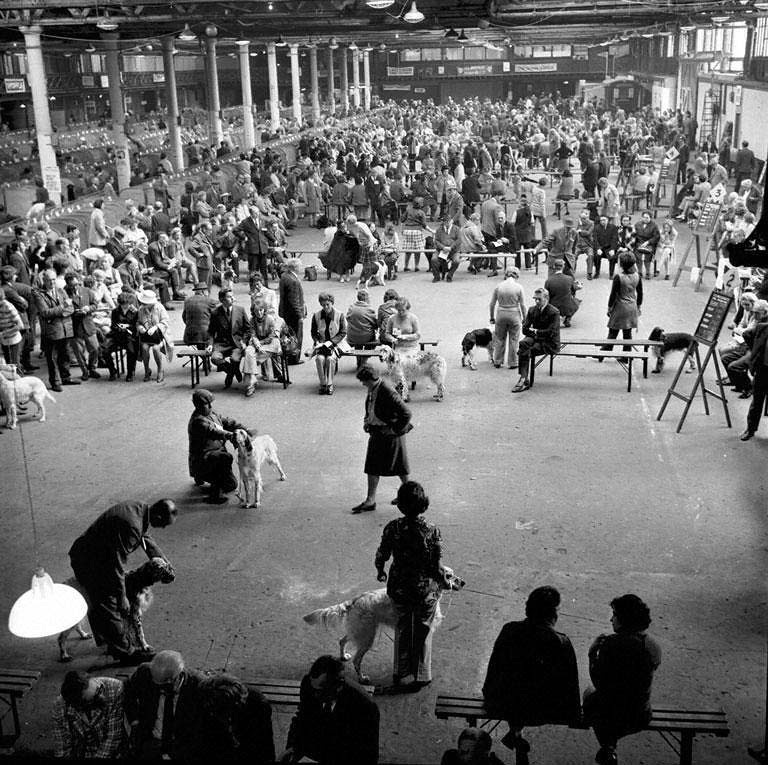 I am merely pointing out that in a dog show the competitors are not being judged one against the other, in as much as they are being judged against the ideal of that particular breed. Whatever the agreed upon standard is, the winning dog, it is argued, showed closest to the idealized standard. On the other hand, the beer people are more like folks who love designer dogs, mutts, and good old fashioned strays. The weirder the cross - a Dalmatian with a Chinese Crested - would serve as an amazing experiment. In the world of beer, the resulting beverage these days, isn't half as fun, as the process by which you arrived at it. And this is the essential difference between wine people and beer people - especially on the east coast. East coast winemakers are constantly comparing their wines to ideal wines - classic wines. 'This is like a Burgundy', 'this is like a Bordeaux', 'this is like a Sancerre.' They (We) appear desperate to measure up. And the judges who write about wine think the exact same way. Your wine isn't quite a Corton or a Montrachet. It doesn't measure up to Graves or doesn't have the finesse of a fine Chablis. Wine people (winemakers and wine writers) are wound up so tight, that their values are sometimes too high to be achieved. It seems sometimes a fool's errand in fact. Let's face it - wine people are just a little uptight. The value judgments of the entire industry, from all sides, including the consumer, is about chasing the other guy, or some unachievable ending. Let's play this out. It is unachievable, because I, and many others, believe in something called terroir, or as Matt Kramer says, a sense of somewhereness. Nothing grown in California, or Chile, or Australia, is going to taste like anything in France, or Italy, or Spain, etc. And it shouldn't. It should reflect is own sense of style, grace, flavor, complexity and balance that is the result of is own sun, soil, climate, region, and microclimate. The concept that a Hudson Valley, or a Virginia Piedmont, or a North Fork wine should somehow eventually taste like some other region is an unfulfillable goal. A fool's errand. Now, let's switch to the craft beer people. I've had the immense pleasure of working with several top beer people who have certainly educated me on the cutting edge of what is happening in the beer industry. Cutting edge craft brewers are breaking new barriers every day. They are making Imperial Stouts in Bourbon barrels and making 16% alcohol beers that smell of bourbon and taste of chocolate and licorice. And they are applauded for it. They are barrel aging in old Merlot or Cabernet Sauvignon barrels. They make beer in barrels infected with brettanomyces. Even cidermakers are crossing boundaries making cider using Belgian beer yeasts and making Beglian Ale styled ciders complete with sediment on the bottoms of their cider bottles like Trappist ales. The dog analogy applies. The resulting beer is always cool. There is no right or wrong. Flavor is all that matters. The process by which the beer or even cider was made is the story. Craft beer people are mutt people. They are designer dog people. Mix and shake and blend and throw the switch! It's fun! And their writers applaud these experiments. The weirder and cooler and more extreme it is, the better! They salute their brewers for their bravery and ingenuity - for their cleverness. Few ever ask the beer people - are your hops local? your barley? do you make your own malt? what do you mean you don't grow your own ingredients? Beer people, consumers and writers, seem to just want to celebrate the new style, and call it a success. Sure, sure, I know, not all the brews on RateBeer.com are not positive. But few reviews say, well its not a Samuel Smith Imperial Stout, or a young's Chocolate Stout, or a Chimay. Beer drinkers seem to live more in a meritocracy. At one point or another, we need to say, this east coast has a style - tasty, well balanced light-to-medium-bodied reds (great food wines), and good clean refreshing zesty whites (also great with foods). We don't make anything like they do in California. And we don't make anything like they do in France or Italy. We make what we make. Is there room for improvement in the taste, quality and production? Sure. There is in any region. But I am tired of apologizing for my dog. I am a big fan of Paumanok Vineyards. One of the things I like about Kareem is that he makes a lot of different kinds of wines. He believes in diversity. And you know what? There's not a clunker in the bunch. Is that a compliment? You betcha! California, France, Italy...good wineries, great wineries, make great wines across a broad spectrum. No matter where you are in the world, you can always find fault with one or two wines in a line up. Kareem is a deft winemaker. He has an easy hand. His wines are fruit forward, but with balance. And all of them are excellent - clean, consistent, and made with quality in mind. That's an accomplishment, especially when you think he's young and has a long way to go. What he might achieve could be incredible. What he has already done IS incredible. You've got to taste his wines! But Kareem is thoughtful, when he speaks. And he's always interesting. Kareem Massoud was born in Bahrain in 1972. By the late 1970s his parents, Charles and Ursula Massoud, had moved to Connecticut where they began a search for a site to plant a vineyard. In 1983 they founded Paumanok Vineyards in Aquebogue, NY, on the North Fork of Long Island. After earning a BS in Economics from the Wharton School at the University of Pennsylvania, Kareem had a brief career in New York as a private equity analyst at a private investment firm. He decided to move on and ended up back at his family's estate winery. Although he has been working full time at Paumanok for the last 10 years, Kareem Massoud has been actively involved in his family's wine making business since its inception. Kareem is a second generation winemaker, having learned the trade under his father's tutelage. His international travels to South Africa, Germany, New Zealand and Chile have given him a wide range of experience in the art of wine making. Paumanok has been recognized with numerous accolades over the years including Wine Spectator's Critic's Choice Award, NY Wine & Food Classic's "Winery of the Year" Award and "outstanding" reviews in Robert Parker's Wine Advocate. Outside of Paumanok, Kareem serves on the Riverhead Farmland Preservation Committee, on the Executive Board of Long Island Farm Bureau as Treasurer, and is currently Chairman of the New York State Wine Grape Task Force. OK, this is my last post about EWE 2014, but I have to say there were a great many notables from u and down the eastern seas board there at the event! Here's a second little photo album of the folks who showed up!